This graph, which does not include the latest rate of return on investment or scheduled increases in contributions rates, shows the volatility in CalSTRS' earnings over the past decade. 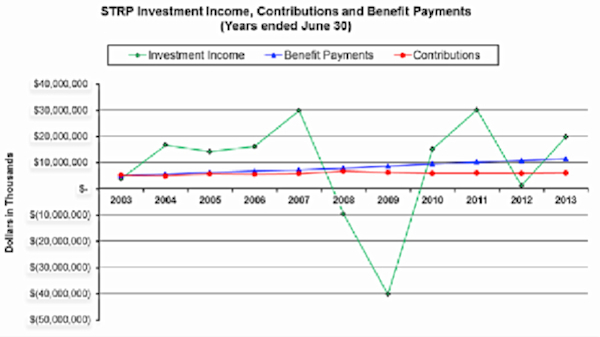 Benefits payments increased while contributions from employers and employees declined, reflecting staffing cuts during the recession. A coalition of school districts wants Gov. Jerry Brown and the Legislature to clarify how much money will be available to schools following the deal that legislators struck earlier this year requiring districts to make higher pension payments. The coalition isn’t asking for the state to pick up a bigger share of the expense, recognizing that won’t happen. Instead, it wants the Legislature to distinguish retirement costs that districts must pay from the rest of the general funding that districts receive under Proposition 98, the formula that determines how much money K-12 schools are entitled to. The effect would be to shrink the amount that districts get from the Local Control Funding Formula while sending a clear message to temper the public’s and staff’s expectations: There’d be more money to go around, were it not for escalating retirement expenses. “We are seeking a different funding method to deal with the extraordinary cost to bring security to the retirements of school employees and to bring transparency” to the Local Control Funding Formula, board members of the CalSTRS Funding Coalition wrote in an article last week announcing its formation. It was published on the website of California School Services, a school consulting and lobbying firm that said it supports the new effort. The four-district coalition, which expects to grow, includes Los Angeles Unified, the state’s largest school district. All three contributors to retirement benefits for teachers – teachers themselves, the state and school districts – will pay more under the legislation approved this year. Districts will absorb 70 percent of the increase, rising from several hundred million dollars this year to nearly $3.7 billion annually in 2020-21. 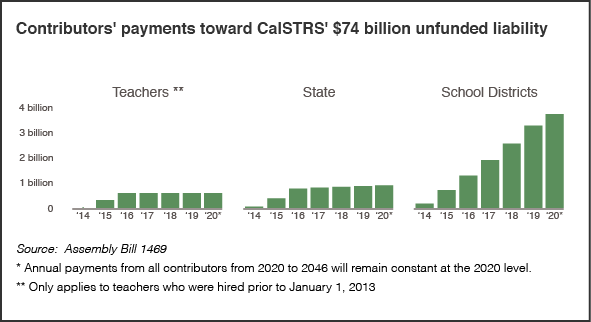 In June, Brown proposed and the Legislature adopted substantial increases in contributions to the California State Teachers’ Retirement System. Teachers, the state and districts will pay increasing amounts over seven years. The higher rates will bring the pension program to full funding in 30 years, wiping out a $74 billion deficit caused by plummeting stock values and investment returns in the 2008 recession. Total annual contributions will double by 2020-21 and then continue, with school districts bearing about 70 percent of the $5.2 billion increase. The coalition said that CalSTRS costs will rise from 3.8 percent of an average district’s budget to 9 percent over that time. That increase will cut into money the Legislature anticipated districts would spend as funding was restored to pre-recession levels. Under the new funding formula, districts are also planning to spend more as they expand programs for “high-needs” students, including low-income students and English learners. The state’s share of pension costs, though smaller, will also double, and teachers’ contributions, deducted from their paychecks, will rise by about a quarter, from 8 percent of their pay to 10.25 percent. The coalition is asking that districts’ retirement charges be a separate account within Proposition 98. Districts currently have to make room for retirement costs within the Local Control Funding Formula. Since retirement costs aren’t discretionary, they shouldn’t be part of the formula, the coalition argues. “If it had been a one-time increase, we would be fine, but it will continue to grow for six more years,” said Scott Siegel, superintendent of Ceres Unified. When it passed the new funding system in June 2013, the Legislature set the goal of restoring funding for all districts to 2007-08 levels within seven years while providing additional money for high-needs students. But that was a year before lawmakers passed the plan for rescuing the CalSTRS retirement plan. Setting money aside for CalSTRS obligations would delay reaching the funding goal, though the coalition didn’t estimate by how long. “For all stakeholder groups, there’d be a clear picture of new money coming to districts – how much parents can expect for targeted funds for students and how much is available for teachers to negotiate pay and benefits,” said Scott Siegel, superintendent of Ceres Unified School District. For his 12,000-student district, higher CalSTRS expenses will cost an additional $1 million annually out of a $100 million budget. “If it had been a one-time increase, we would be fine, but it will continue to grow for six more years,” he said. Desert Sands Unified is also part of the coalition, along with Los Angeles Unified, Ceres and Grossmont. Patterson said he expects the coalition to grow to 150 to 200 districts – whichever are willing to underwrite the lobbying effort. He said that the coalition has not yet presented its idea to officials from the Department of Finance, which prepares Brown’s budget, or to legislative leaders. “I can’t think of why a district would not be in favor of this,” Patterson said. H.D. Palmer, spokesman for the Department of Finance, declined to comment on the proposal, pending the release of Brown’s proposed state budget in January. Assemblyman Scott Wilk, R-Santa Clarita, introduced Assembly Bill 6, which would cancel outstanding bond funds approved by Proposition 1A, a 2008 voter-approved initiative to fund the state’s high-speed rail project with $9 billion in bonds. In its place, voters would be asked to spend the remaining funds on constructing and modernizing dilapidated school facilities throughout the state. Wilk points to a Jan. 2014 report by the State Allocation Board that contends California needs to devote as much as $12 billion toward new school construction and another $5 billion to modernization of existing facilities. The obscure board, which includes representatives from the governor’s office and the Legislature, couldn’t definitively peg the total cost of school modernization. Other State Allocation Board estimates put the figure between $5.9 billion and $6.6 billion. If anything, they should cancel prison spending instead. The alternative to the high speed rail project isn’t nothing; it’s spending billions of dollars adding a lane to Hwy 99 and expanding airport facilities. One of the coolest things, IMO, about the HSR project is how it would link so many of our major universities to mass transit, making it much more possible for people – young and old – to visit them quickly and efficiently and without having to drive. I see this project as being highly complementary to our educational infrastructure. It also flies in the face of some emerging trends. Certainly there is a national and negative reaction to over testing. High test scores have been a major thrust of charter school cachet, even though the empirical evidence showed that to be a matter of “false advertising.” It may well be the charter ideology was part and parcel of the test based accountability movement that is now rapidly dissipating. Ironically (in some ways) the new resistance to federal government “overreach” with testing and CCSS may play into that also. Politics as well as pedagogy sometimes makes for strange bedfellows. On a practical level, any movement towards charters or away from pensions and reasonable compensation for teachers will undercut that trend to make entering the field more rigorous and increasing requirements for professional learning. Increasing circumstances where professionalism is undercut and people are moving in and quickly out of the profession with little training or experience (as with TFA) runs contrary to what most researchers and policy experts are calling for. You might suggest that a TFA-ication of the profession is still what the self-styled “reformers” are calling for, and I would suggest cognitive-dissonance and/or plain old hypocrisy. The fact that the market is not always deterministically predictable does not mean it doesn’t have observable forces (though I think the economic chaos of those years actually made complete sense given circumstances at the time). And humans do not need to be rational for those forces to work (in fact I’d argue it’s assumed they are not–that is why manipulation and emotion are so important). I’ll leave the question of whether pension systems are good investors alone because I was not implying they weren’t. I do, however, have significant issue with the fact that our electorate had to enable equity investment for pension funds, and that that move contributed to the bubble that precipitated the collapse, and that that bubble led to irrational (in hindsight) pension obligations enabled by elected officials, and that the public seems to believe they had no role, and thus no responsibility in all this. (And no, that has nothing to do with anecdotal top-echelon absurdities). That said, objectively, losing 40% of investment value does not seem like very good ‘investing’ but that’s more a personal statement about our economic system as a whole, and thus a tangent. It is, however, a valid issue if we believe public pension money should be subject to less risk. (?) But I don’t see that discussion realistically happening anymore. I also am not sure about the consistency of claiming pensions are good for the good in markets but someone else is bad for the bad parts. Public pensions and 401ks made the bubble even worse, and the latter arguably even created it. If you want to argue we’re better off even with those collapses (and what caused them) then fine, but it doesn’t sound like you’re saying that. My own take is that pension systems partake in the market because they must. It’s why they asked for equities. It’s why they had to increase benefits. That participation comes with the good and the bad. And if pensions being good for the market is an argument for pensions, then it’s also an argument for 401ks, which I think should be treated differently due mostly to the impact they have outside the market per se. On the other issue, it is true that charters already have enough problems enticing teachers however some things are changing (and note that is not prohibiting continued exponential charter enrollment growth anyway). First, there are fewer and fewer TPS jobs out there. At the current rate there will be none in about ten years. In a market, you don’t have to provide perfection, you just have to provide an advantage. TPS will likely even scale back salary schedules to pay for the increased benefit. LCFF also provides charters with relatively more money than they’ve had up to now. navigio, one nit: I don’t think irrational promises have been made when you assure someone that if they work for 42 years they will retire with the same salary they ended with. I don’t think (but I could be wrong) that such retirement tables were created immediately before the bubble and thus led to what you call this “irrational pension obligations.” I think these tables have been there for at least 10 years so why blame the bubble for them? As for what the contributions are, well, prior to Brown demanding that districts contributions be increased until they hit 19.1% in 2020-21, the contributions were 8.25% and teachers were 8.15%. Teachers will also be paying more into STRS in future years but the contributions are still the same for 2014-15 while districts had to up them to 8.8% this year. And, yes, because teachers are in the STRS, there is no contribution from the districts to Social Security, but there is one to Medicare of 1.45% (or so LAUSD reports in their documents). OTOH, districts contribute much more to CalPERS for their other employees. In 2014-15, for example, the rate was 12.52% to 19.52% for LAUSD employees according to their classification. LAUSD also had to contribute to Social Security and Medicare, so the costs for all those employees totaled 23.18% to 30.18. So why isn’t anybody complaining about those employees? Why are they only bashing teachers? BTW, it is a good thing that districts have no firefighters. But some, like LAUSD, have a police department. For the 2014-15, LAUSD’s CalPERS contribution for its chief of police is 33.34% but it goes as high as 42.34% for police officers and detectives. There might not be as many of those but they sure have a large individual footprint. That little bit was a 30 year history. The changes to benefits I was referring to was at the end of the 90s when pretty much everyone was making money hand over fist. Double digit returns were the norm. Some crazies even argued they could double those rates! Flush with money and sometimes even over-funded, pension benefits were increased. I did not mean to imply that tangent had anything to do with teachers specifically, in fact, I think at that time teachers even comparatively where the losers in that frenzy (maybe your other rate quotes corroborate that). And when I used the term irrational, I followed it with ‘in hindsight’ because most people believed the changes to benefits were fine at the time given the ‘new reality’. That new reality turned out to be a false one. And as people realized this the logic behind those changes really began to be questioned. So irrational is a relative term not an absolute one. As to the other issue I think you answered your own question. Footprint is absolutely relevant for why people focus on teachers. My bringing up calstrs was not to attack teachers or pensions, rather merely to highlight what I think our public policy is trying to achieve (or maybe just will achieve even if not intentional). There are obviously all sorts of other contributors to increased charter creation. I also didn’t mean to imply this somehow was the only or even primary one. The only changes to STRS made in the last couple of decades I am aware of had nothing to do with the “irrational exuberance” manufactured by the techies and picked up by Wall Street, and that was to add a couple of ticks to those who agreed to teach until 62 with 30 or more years of experience. That wasn’t added to enhance pensions per se, it was added because the leading edge of the boomers were retiring and that whole education system thought it would be a positive to keep more experienced teachers longer. It was a longevity increment. A slight correction: there have been changes to STRS since enacted and signed by Brown that calls for “new” employees, hired after the legislation to receive “full” benefits at 62 rather than 60 with 30 years of experience. regardless, that was a tangent intended to highlight two things: the inherent problems with investing db funds in unreliable financial sectors, and the responsibility of voter actions in everything that happened back then. those things should not be interpreted as a critique of the concept of pensions nor of teachers, as you seem to want to believe they were intended. Thanks for continuing this interesting discussion on pensions. Thanks john. Two problems I noticed with that paper. The first is that it effectively equates pensions and debt. That perspective wholly ignores the whole point of paying people to do a job, including any retirement as part of that. As an ‘economic study that is maybe understandable, but it’s still a bias from the outset. (Similarly, I’ve always had a problem with the term ‘unfunded’ when applied to future obligations). The second is the reference to ‘raises’. Although the paper appears to be careful about how it uses the term (ie not to mean step increase), it’s suggestions of schedule compression and fixed dollar raises instead of fixed rate changes as a means to make pension debt more manageable means they are suggesting lowering top teacher pay. I think that implies they are talking about a lot more than just raises. Those things aside, one thing that is almost always ignored in these discussions (and why I don’t like ‘unfunded’) is that these ‘problems’ are subject to being manufactured. The primary reason we appear to have so much ‘unfunded debt’ is we haven’t been contributing as we should have been. One of the changes at the end of the 90s was even to reduce contributions! But even then, we don’t fund our pensions the way we’re supposed to (health retirement benefits as well). (Pew trust has awesome studies on this). Personally I think that’s yet again an example of ‘negotiating through policy’, though I know many will call foul. Politically it’s much easier to promise something, refuse to fund of then later cry we can’t afford it and do away with it altogether. Also relevant to this discussion are the recent goings on related to pension benefit cuts after the fact (fed spending bill of a few days ago) and new ‘rules’ associated with bankruptcies. Interesting to me that that paper is fixated on how to lessen final salary bumps and doesn’t really suggest the alternative of averaging salary over more years to calculate the pension. And this would be a fair and reasonable way to change things in the future, because it would ensure contributions are a closer match to the benefit payout. Like navigio, it concerns me that people are so willing to just write off pensions as some unearned frippery, debt that isn’t really owed. It’s a contract of deferred compensation and gratification, just like handing over your savings to the bank or buying a life insurance policy. Gary – to quote Mark DeSaulnier from Contra Costa County “mistakes were made” to pension promises made during the so-called Greenspan irrational exuberance. DeSaulnier said this at a PTA Advocacy Day meeting a couple of years ago. Most people understand pension for teachers is deserved, but they are way too generous hence their projected shortfall. We now have District contributions to pension ramping up over 7 years, as you know. John brought up the Georgetown study. Where I live, we call this pension spiking, which occurs in the last year of employment when unused vacation, sick, etc etc is added to the last year of compensation thus locking in a higher pension for life. This is a rip-off to the taxpayer and attempts have been made to eliminate the practice. Let’s not mix our apples and oranges here. The changes made to “some” pension systems in the late 90s, before the phony tech boom imploded, were mostly done at the municipal and county levels and frequently for safety personnel not teachers. Not only were benefits increased, but “pension holidays” were granted so that those counties and cities didn’t pay into pension funds then, when they had dollars, which contributed to the “underfunding” asserted to exist today. But that’s the PERS system. As I stated I know of no significant enhancements made to made to STRS except it was final year, as I recall, for the calculation rather than final “three year average” and the changes made to add some fractions of a percentage to the final calculation (per year) if you completed at least 30 years and you agreed to work until you were 62. Again, these changes were not made to reward teachers, they were longevity increments made to encourage long-time, highly experienced teachers to stay in the profession. And this was due to demographics. High numbers of boomers were exiting which was creating personnel churn and a loss of experience and “institutional memory” that disrupted schools and inhibited instruction. It remains, as far as I am aware, possible to put a couple of percentage points onto your final calculation if you have sufficient unused sick days remaining. They are, of course, a part of compensation. The possibility of “spiking” retirement is almost unheard of for anyone in the teaching ranks. The various manipulations that accomplish that are difficult to do under that standard “uniform salary schedule” and generally you will find only individuals in higher management who have done it. The “average” teacher retirement in the state, as far as I am aware, is now around $45K to $50K which will (barely) keep you in your home in many parts of the state. And that is after 30 years in the classroom. Many if not most districts have no health coverage for retirees. Personally, I think there are two reasons more charters don’t choose to opt out of calstrs at a higher rate. First, they are supposed to opt in to social security if they do, so there is not a huge financial benefit there at the moment. That, however, will change with these regulations. Second, and more subtly, many to most charter teachers and administrators come from the TPS system. This means there is considerable momentum to leverage their existing pension equity. This one probably not even money can counter until charter penetration has been around for a while and those who run the schools are less TPS-bound. But note that the creation of charters does not actually have to address the problem. The question is whether TPS BoEs will be more likely to push and approve charters in an attempt to avoid having this additional and significant expense. Even if charters are able to continue relying on the state pension system, they now have additional financial capacity to do so, and notably from a market perspective, in a way that TPS do not. Some local BoE members are even likely to thus see charters as a more effective use of money. (Interestingly, there is already one district that has given up their TPS schools altogether and now survives solely on taking revenue for managing charter schools. I think we will see more of that in the future). Charters were never about actual accountability. So the fact that the testing environment might be dissipating is not going to impact their growth. Regardless, we are never going to get rid of basic ‘proficiency’ accountability metrics and there are enough other drivers for ‘proving’ schools are ‘failing’ based on those. Charters may have used that for kindling, but the logs are coming from a different tree. Imho, there is no real desire to make teaching more rigorous (look at new ‘teaching’ models and even common core to some extent’, and for those who believe in markets, where is the top competitive teacher pay?). Rather there is a desire to be more ‘effective’. What we see as effective is different than what those with the purse strings see as effective. TFA-ication is probably more a symptom than a cause so what happens there will depend on other things. Note the federal spending bill extended the ‘re-definition’ of ‘high quality teacher’, the arguments for which are among the most absurd I’ve ever heard. That is actively going in the opposite direction. Reading the tea leaves is just one other form of Rorschach test. I look at the swirling patterns and see different things. I’m still noir sure how the “reply” system works now; however, I will try this. My point, Zeev was that considerations of the viability of Social security and public pensions are not primarily about fiscal issues. They are really ideological and political. STRS and PERS are public pensions systems and there is not an essential anomaly that capitalization is, in part, a public obligation. Just as there have been reactionary forces afoot since the 1930s who have been ideologically gobsmacked by the idea of the federal government actively “promoting the general welfare” with Social Security, there are those who respond in like manner to public pensions. As Pavlov demonstrated, ring the (progressive) bell and the (reactionary) dogs drool. With the new “majority” (again elected by a record setting minority) in Congress we will likely see new attacks on Social Security. There will be the same kind of “chicken little” hysteria generated by politicians and lackeys in the media. I suggest the attacks will likely fail and necessary adjustments will be made to sustain the program. The problem for the “majority” will be that even the dimmest of the “get your government hands off my Medicare” crowd will begin to see they are undercutting their own wellbeing. And that older and whiter crowd constitutes the storied “base.” And the “new majority,” with good reason, fears its base. If there is anything that is well demonstrated by economic chaos beginning in 2007/08 is that “conventional wisdom” about markets is a fiction. (Funny how often that happens to conventional wisdom.) People are not “rational actors” and the markets are not self-regulating nor are they much free of gross manipulation. That being said, the public pension systems have been pretty adroit at moving within the various finacial markets added to the fact that they can swing considerable weight themselves because of their size. Looking at the historical, as opposed to hysterical, record it can be demonstrated that their size and ability to diversify have generally served participants in the systems as well as the public fairly well. And this should only be looked at in the context of defined benefits that are modest generally speaking. The opponents like to drag out some outliers from top echelon management and anomalous cases of spiking to draw pictures of “out-of-control” retirement systems. So, in general, the markets being what they are have been fairly advantageous for both state retirement systems. Assuming the “new Congressional majority” doesn’t get things too much its own way and allow Wall Street to go berserk again the systems should be fine–over time. As to the pension systems being drivers of increased reliance on charter schools, I kind of doubt it. Charters already have enough problems keeping employees, taking a strong stand that they are opponents of secure retirements for their teacher will not be a good advertising strategy. Gary, if you click on the arrow icon to the top right of the comment, next to the other icons, you will be directed to the comment box where you can type in a reply. It’s clunky right now, however. The latest example of a lack of transparency which has not changed (probably gotten worse) with the new Local Control accountability plan is the Audit for Capistrano Unified School District ending June 30, 2014. CUSD has to be the poster child for the failure of LCAP to give parents any say in how money is spent. The District received $8.24 million in new LCFF money. Employees, District Staff and Union elected Trustees delayed contract negotiations so that new LCFF money could be added to what was a COLA only budget so that they could claim that trigger language in the contract had been met which would allow the District to restore employee salaries. So the new LCFF money went straight to salary restoration (before any LCAP plan was in place) and students had 3 instructional furloughs and a class size increase of 1.5 students across all grades. The Audit that was presented at this weeks Board meeting proves all of this to be true- but no one cares so our public education system is nothing more then a conduit to pass money from taxpayers to the public employee unions. I will never vote for a tax increase again that tells me that the money will go to students. Dawn, the only real direct power that parents have over school districts is in their ability to vote for the members of the school board. Here in San Francisco and elsewhere this means a major uphill battle for anyone who has not been pre-selected by the union to represent its interests. That the LCAP has not fundamentally changed the power structure is no surprise. All the LCAP requires is “input” from the community. Over the last year much has been written about this input here on Ed Source. What you won’t read is how accountable districts are for making that input policy. At present the only oversight is what comes down from the COE. In other words, local control is (at least in part) about the State getting out of the business of oversight. Consider the Uniform Complaint Procedure (UCP). This used to be a pathway for complainants to get dispute resolution. But it was set up to deal with categorical issues and now that categoricals have been largely incorporated into the LCFF, it no longer functions as an avenue of assistance for community members in the way it used to. Notice that nothing has been instituted to replace it. That’s local control. So we are back to electing board representatives. Ultimately, that is local control – not the phony promises of community input in the LCAP. Without the backing of an organization that can influence elections or muster the resources to bring suit, a parent like yourself has little ability to force districts to be accountable. It should be noted that before LCFF we had the same lack of accountability even with somewhat more state “oversight”. So you end up banging your head against a wall as a concerned, informed but solitary community member. And that wall is a barricade between establishment controlled by the unions and their elected partners in government and you – between true community input and what goes for accountability nowadays. And that wall is higher at the local level because it is more difficult to fight the power of the union locally than at the state level, though perhaps that’s debatable. If a person like yourself wants to run for school board you have to come up with about $100K to compete against the local union. Most people willing to spend that money are using the school board as a springboard to higher office. So you can’t expect them to fight for your sincere interests. Dawn, this is all to say – you need to build an organization if you want to get results. Gary – irrespective of anyones political views. The math simply does not work. If you fund my District at 2008 levels ($8, 500). We will never see the restoration of any programs- our buildings will fall down (as they are already) and we will see class sizes continue to climb by 1.5 students per year just to pay the cola increases and we will have to deficit spend to pay 10% of our District’s budget to pensions. Even if every teacher in my District (average compensation $105,000 per year) were to retire, all the saved money would do is (as it is designed to do) pay for employee benefits and new teachers salaries. To be honest- there is no intent on the part of the State of California to educate every child. This system is designed for no other purpose then to create jobs for the CTA and to redistribute wealth. How sad for ALL the students in my District. Again, your interpretation of data re compensation seems superficial. Something that is not mentioned much is that the outer limits of the public school universe do not stop at the city limits of LA, SF, or Capistrano for that matter. There are other appropriate lenses, a statewide one for example. It will be necessary for folks to accommodate themselves to the fact that teachers, not primarily motivated by dollar issues, are also not monks sworn to eternal poverty. As the study this site recently showed about teacher compensation nationally, teachers are not being over compensated. Teachers deserve compensation within reasonable proximity of other professionals of like education and qualifications. * In the case of teachers and many other public employees compensation is somewhat “deferred,” what isn’t paid monthly or yearly is paid in promise of a secure retirement. If it your intent to try and get reduced compensation for teachers in your district then prepare to deal with the obvious negative instructional consequences. You are correct that this state cannot adequately provide for what student’s need instructionally or teachers need professionally because of lack of funding. The state currently provides education (K-16) more than half of its budget. The state has other necessary and legally mandated requirements to fulfill. The problem is: CA does not collect enough in taxes. To do what you want to do will require modifications to Prop 13, reductions in business tax breaks, imposition of an oil severance tax, and likely permanent and higher taxes for the wealthy. You, as well as many other Californians, want all manner of increased levels of service from all levels of government and don’t want to pay more for any of it. That is not possible. *And before any of the cynics start bloviating about how teachers are really at the “bottom of the academic barrel and don’t deserve compensation comparable to other professions” let me refer you to the study done by the Educational Testing Service (ETS) called “How Teachers Compare,” to be found at the ETS website. Dawn: Gary will also tell you that there’s no such thing as a bad teacher only a teacher that needs more professional development. However, if bad teachers were instead bad policeman the same thinking people would reverse and tend towards locking ’em up and throwin’ away the key. It isn’t about politics or even ideology. It’s about holding onto what you’ve got. A professional organization should strive towards high standards and should self-select out those that don’t meet them – for the betterment of the profession as a whole. That isn’t what you see in the teaching profession as a unionized manifestation. As Gary pointed out teachers have been historically underpaid and have received security in exchangeWhere teachers are better compensated I don’t see any exchange for less security. No matter how much teachers earn Gary will always conclude they are underpaid and that they deserve the highest level of job protection. I like the teacher who gave my kid A’s and who never burdened us with too much homework. What could go wrong? Only life! Washington DC once sent a valedictorian to Harvard. She flunked out. This is why SAT Scores are more accurate than grades and are a morally neutral measure of human goodness. Don, you know grades can be inaccurate. A GPA at Lowell is probably a point higher at Washington or Walnut Creek or Burlingame High because 25% of kids in most classes get As and Lowell selects the top 15-16%, or aims to. SAT crosses boundaries, so do other tests. A 1450 SAT is the same whether you have a 2.5 at a tough school or a 3.5 at a bad school. It could be a reasonably accurate measure of academic ability across biases based on differential teacher and high school difficulty and arbitrary factors in grading. This comes down to a central point. How should colleges judge ability? This is what the recent lawsuit alleging Ivy League discrimination against Asian kids is about. The claim is they have fewer intangibles and extracurriculars, but a study at UCLA showed no such difference. Are they making a fair analysis or discriminating in the same way Jews were once discriminated against? A judge will soon decide. How do you measure quality of academic ability and pure humanity at that age? Remember, colleges factor in extracurricular activities and volunteering and essays to have it based on more than just grades. I think grades can be quite misleading, much more so than tests. Test experts agree that preparing students for these test creates testing error. If you want to get a real morally sound measure don’t prepare your children for the tests with prep books, etc. The fact that you do that tells me you really aren’t interested in students getting a fair and equal opportunity to demonstrate ability. The funny thing Don is that the tests are skill based. Whenever I studied for the tests with my kids, the only thing that happened was I pointed out where they made a mistake so they could learn to not make such a mistake. It might involve math, or placement of commas, or grammar. It might involve reading comprehension where they missed something. I taught them how to look back at the information they read for the answer. All of this will come in handy in school and also in life. None of these were slick manipulations to fool a test, they were skills we wish kids to develop. Everything I taught them in doing these workbooks added knowledge and/or skill to my children. The books themselves have helpful hints such as what certain prefixes mean, information which is good to know. So I would say from a hands-on perspective, studying for those tests improved their knowledge and skill, which if you improve one factor of a person you improve that person overall. It doesn’t make the other factors worse, at worst those stay the same, so you are improving when you study for a test. The conversations that come up teach basic knowledge and that time is spent by most others watching TV. I guess theoretically someone else may be at a lecture or art museum or somewhere learning something better, but most of the time it would simply involve entertainment, music or TV. I do believe if every parent did this, the average child would improve academically and overall, as reading has been shown to increase interest in the outside world and events, and be associated with higher voting percentages. I would prefer that teacher salaries be funded by the State of California. Establish a statewide salary schedule for K-12 teachers and have pay distributed from the state. Sending funds to the district, and then having each district set up separate salary schedules makes the funding of schools more complex. If teachers were paid directly by the state, the districts would no longer be involved in the annual salary negotiation process. Furthermore, allow teachers to transfer from one district to another with full credit of years taught. At the present time, a teacher in district A who transfers to district B after teaching 20 years will only be able to transfer about 6 or 7 years of seniority. With a statewide salary schedule, funded by the state, teachers would be able to maintain their full seniority. Additionally, districts would be able to hire the best teachers available without salary considerations. The current plan will force districts to make major contributions to STRS. Let districts concentrate on improving education, not reducing funds for students by paying significantly more for retirement contributions each year. If teachers were paid on a statewide salary schedule, the state would fund the retirement contributions, leaving significant more funds for student education in each district. Alan, when you say “districts would be able to hire the best teachers available without salary considerations,” this is ‘free lunch’ thinking. I think you would find that there’s a reason why districts make different choices about how much to pay staff. Teacher salary schedules across California vary by more than a factor of two. Some places pay more because they have very high costs of living. Some pay more because they are in unusually undesirable areas. Some pay less because they have lower costs of living and prefer to have more staff per student. I don’t see the downside in letting the people on the ground decide whether to pay fewer teachers more money or more teachers less money. Districts are not all equally funded. Those districts with more funding often collect more taxes due to higher property values. So the current state plan to make up the pension funding allows it to tap into those dollars. Maybe not a lot in aggregate, but our frugal governor is taking advantage of whatever he can. The issues around STRS and Social Security are similar in many ways. Social Security has faced funding issues before too, but reasonable legislators (that was back before the “Party of NO” decided it had no capacity for being reasonable) settled the issue and it will be settled again in the near future. If one looks at the graph provided able it is obvious that STRS investment income typically remains relatively consistent and high with fluctuations in the market. STRS was aware for some time that some adjustments (aka, like those to Social Security) would be necessary, but then came the “off-the-cliff fall” due to the wild gambling of the financial sector. Not too many years ago STRS faced full funding of the system. The current “crisis” was not ruled by excesses of the STRS system, but by excesses of Wall Streeters who walked away from the crisis they caused with huge bonuses. Analysis of state tax giveaways to business interests indicate if the tax loopholes were closed both STRS and PERS could easily be funded without increases to employees or employers. This fact is ignored in the same way that the hole punched in the state budget (requiring huge cuts to education) was created by the Governator’s cut to vehicle license fees and then further exacerbated by the antics of the derivatives crowd. Fluctuations in the funding of pension systems are “natural,” if you think markets are natural. To correct this current downturn a political, not fiscal, decision was made to fully fund the systems in a relatively limited number of years. Many credit rating agencies assert that 70% to 80% of funding actually represents “full funding” of the systems. That makes sense fiscally, but not politically since it requires some study on the part of the public. Not a likely occurrence. Actuarially it might have made sense to take the funding horizon out to several decades. Again, it’s politically more convenient to scream the pension sky is falling and take positions that are politically easy if not fiscally realistic. Luckily the current law has sidetracks built in so the funding situation can be reassessed periodically. To those in the private sector who are being convinced that public employees have it “too good.” The question you should be asking is why do we in the private sector have it so bad? At one time many in the private sector had defined benefit pensions too. You lost those as the power of unions has declined. You also lost earning power. All this occurred while corporate profits trend ever upwards. That’s why the minions of the 1% are so eager to undercut public sector unions and their compensation. If you in the private sector ever realize that you must bring your levels of compensation up and not bring the public sector down then the 1% is cooked. Taxes will go to levels not seen since Eisenhower and the tragic inequalities in wealth will begin to disappear. Oh, and the public schools might get funded adequately too. Everything you say is true. Unfortunately it doesnt matter because market forces beat out logic and truth every time. Charter policy will be used to ‘fix’ this ‘problem’. LCFF and the regulations mentioned here essentially guarantee that now. And btw, the federal spending bill included a rider that allowed cutting pension benefits after the fact. What do you mean when you say charter policy will fix the pension problem? That it will encourage more charters? Yes. These rising contributions will now create a substantive reason to opt out of calstrs (which charters can do and TPSs cannot). I wonder why you feel that “STRS and Social Security are similar in many ways.” Social Security is funded from equal contributions by employers and employees (actually, a bit more from employees as independent contractors pay both halves). Could you tell please us how much of STRS capital comes from employee contributions as opposed to taxpayer money funneled directly by district and state administrations? This doesn’t surprise me in the least. There are many in the state who would like to see pensions eliminated…what better way to accomplish this than by building public resentment against public employee pensions. And school districts ALWAYS cry poverty when they are negotiating pay raises for their employees. Of course, “pension envy” is already a reality, since corporate America has successfully convinced policymakers and the public that workers don’t deserve pensions, anyway. The underfunding of STRS and PERS was ignored by legislators and policymakers for too many years — and was tremendously exacerbated by the financial meltdown of 2008. In the meantime, district after district continues to hire “experts” and staff up district offices, while class sizes remain huge and pay for most teachers remains low. Some things never change. Oakland provides its superintendent and downtown associate superintendents with a perk: the District signs multi-year contracts that provide the District pays retirement contribution of both the employee and the District. Since Oakland Superintendent contract is for $280,000 a year that is one big retirement payment now and really big payment in the future. As the amount of retirement payment into downtown administrator salaries increases their will be pressure to drop this perk even by Oakland’s upper administration friendly School Board that makes its teachers the lowest paid when cost of living is calculated but has no trouble giving top administrators top dollar. John and Laurie, the headline is not quite correct: it refers to retirees’ costs. Those costs are not truly increasing because AFAIK their checks are not increasing more than the COLA. What your article refers is the increase in costs for funding the retirement system for current employees, who are not yet retirees. It is worth noting that increasing the contributions of the districts to STRS is not increasing the future retirement payments to current employees. The rationale is that these increases will guarantee that funds will be there to meet current promises. The alternative would be change the retirement pay formula. BTW, a teacher would have to work 42 years in order to collect a 100% pension from CalSTRS. That’s 2 more years of service than a UC employee (UCRS). And 9 more than a State Patrol officer (CalPERS). Great article John and team. Districts like Mt. Diablo USD that despite knowledge of these massive STRS contribution increases negotiated massive increases to teachers, “me too” raises to administrators, and future “side bar” promises to the teachers unions and other unions to get “union endorsements” for incumbent Board members in the recent election, are starting to realize they can’t find 5.2% of their future budgets to fund STRS contributions. On Wed night, the Board approved its First Interim, but had to significantly reduce its future textbook expenditures in order to get positive certification in the third year out. With little oversight from the county, districts are already robbing Peter to pay Paul just to meet the certifications. As soon as districts are required to plug in the true STRS increases, instantly many districts will be upside down on their upcoming budgets. Stupidity has consequences. Greed has consequences. Stupidity of school boards. Greed of teacher unions. I am against any relief for school districts. They cooked this soup 15 years ago, now they should eat it. Ze’ev, unfortunately it is the students who pay the price for the bad decisions of districts and in particular the students that do NOT receive any supplemental or concentration grants because there are requirements for meeting their needs but not the needs of the rest. I didn’t quite say that correctly. The students who do not receive S and C grants will be the ones to suffer as the funding to pay for these obligations will come from the base grant. Of course, all students suffer when the base grant per pupil is lowered at the district level, but targeted students get some relief. I am sure you are right to a degree. But isn’t allowing school board off the hook for their stupidity, and paying teacher unions for their greed, harming students — and students’ families — even more in the longer term? We already pay plenty per student. If a school district or a union can’t make do with at least quarter of a million dollars per classroom, they should feel the wrath of their citizens rather than have taxpayers save their assess from their own incompetence and greed. Parents – if they understood – would take their wrath out on the District and the District employee unions. However- Parents are intentionally being deceived. There is no investigative press covering education issues. Parents get their information from their child’s teacher, the PTA (if the ledge team is doing a proper job) and the press releases that the District has sent out to parents. Well – of ten the PTA mirrors the CTA (same page most issues) and for one example- during Prop 30- the only message that came form my District was Pass Prop 30 or your child will have 18 furlough days. Never a mention of Molly Mungers tax proposition. So what our District did was identify $51 million in cuts in the event Prop 30 did not Pass and then when it did pass, the District only implemented $30 million of the identified cuts and guess what? The cuts to employee salaries were never implemented- only the cuts to student services. SO the headline was: ” District Balanced its budgets with Employee concessions. That was an outright lie to the public, but the only message that was out their which every teachers repeated to parents and the paper printed without investigation and it was the District Press release. I have documented and proven that; however – it is a done deal and no one seems to care if public disclosure laws are enforced or not. So, at least in my District where current ADA is $7,002 (expected to increase to $8,500 by 2021) we will be closing school to pay our teachers not to teach so that we can pay for increased salaries, pensions and benefits. It is just amazing to watch. Districts will have little choice but to freeze compensation at 2008 levels and to cut student services to pay for the extra pension costs that the State has passed down to Districts. It will help their arguments for additional charter schools. The State has a Constitutional Obligation to fund an adequate education for every student. I think that most people are starting to recognize that funding education at 2008 levels by the year 2021 is not sufficient to pay for an adequate education (hence tuition increases at UC system) (hence furlough days and increased class sizes at my District) especially if the State now wants to mandate that Districts increase their contribution to CalSTRS and CalPERS. Notice how the increase was intentionally delayed until after the elections. Districts need to sue the State of California in Federal Court. The new LCFF law violates the Equal Protection clause of the 14th amendment to the United States Constitution. I have done the research and have written the outline of the law suit. I am actively looking for an advocacy group to sue on behalf of my District which is funded at $7,002 per student. Governor Brown is intentionally underfunded wealthy suburban school districts so that more funding can be allocated to Districts with higher percentages of poor and english language learners. The law discriminates based on wealth, race and ethnicity which is prohibited under the Rodriguez case. Re-read Rodriquez and you will see that the case defined when the Court would find an individual State’s funding law unconstitutional. Any District in the State of California that has less than 55% Poor and English Language Learners would qualify as a plaintiff. Remember- the State has a constitutional obligation to fund education. They must do that before they have the power to create new programs or services. PERIOD. Anyone who would like to join me in this lawsuit is welcome to do so. See also- My March 26, 2014 letter to Governor Jerry Brown sent Certified Mail Return Receipt requested. Under the LCFF it will not be possible for Districts to be funded at 2008 levels by the year 2021, and absorb an increased pension contribution that will equal about 10% of the Districts total budget. Which will represent 9.6% of CUSD’s total unrestricted budget. With employee compensation currently at about 92% of the budget the District would be Deficit spending to pay for any student services.